Bay to Breakers, the world's wackiest foot race, is Sunday, May 16, and you can count on Caltrain to get you there – in record time! Four northbound special express trains will be available to take you to the race. Please refer to the schedule (side) for exact time and station. One-way tickets, Day passes or 8-ride tickets can be purchased at the ticket vending machines at the stations before boarding. 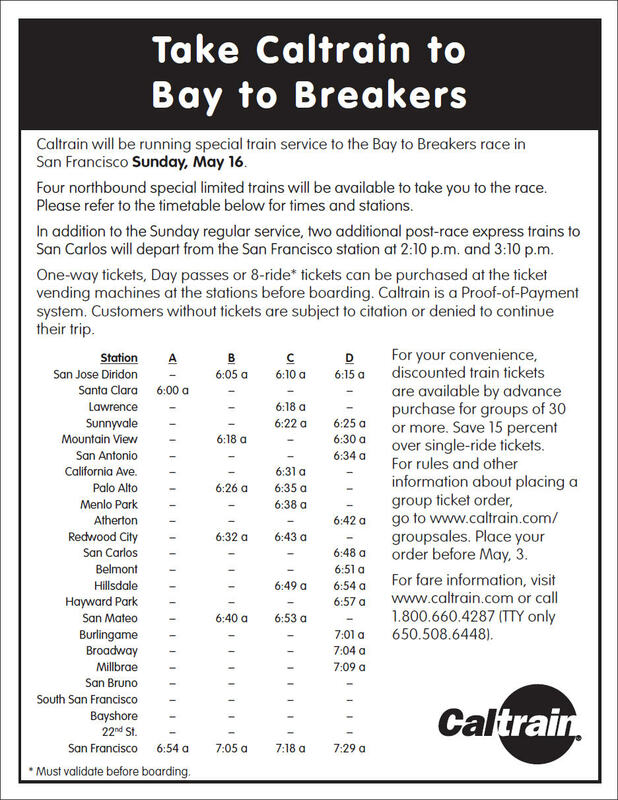 Tickets must be purchased before boarding, and Caltrain fares vary by zone. In addition to the Sunday regular service, two additional post-race express trains to San Carlos will depart from the San Francisco station at 2:10 p.m. and 3:10 p.m. Fare and schedule information is available here or by calling 1.800.660.4287.